SPAIN has lost its coveted top spot in the World’s Best Restaurant awards. But although Danish restaurant Noma knocked El Cellar de Can Roca into second place, Spain still has an incredible three restaurants in the Top Ten. Underlining its status as a global gastronomic giant, Spain also has 10 restaurants in the top 100 for the first time ever. Last year it had nine. Two Spaniards also walked off with gongs at the San Pellegrino World’s 50 Best Restaurant Awards gala bash in London on Monday night. 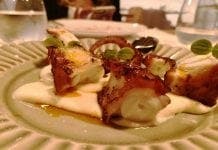 In more good news for Spain, Arzak and Mugaritz, both in San Sebastian, stayed in the Top Ten. And an exciting new entry into the Top 100 was Madrid’s Diverxo, whose mohican-wearing chef David Munoz is set to open a restaurant in London this summer. He told the Olive Press last year how he had been ‘heavily influenced’ by British cooking and loved visiting Andalucia. The UK coincidentally was one of only two countries (the other being America) that had two restaurants in the Top 10. Dinner by Heston Blumenthal was highest placed British restaurant on the list in fifth spot. Other awards included a lifetime achievement award for Fergus Henderson of St. John’s in London. HOUSED in a stunning glass and wooden structure, Azurmendi looks more like a Bond villain’s hideout than an eco-friendly eatery. Eneko Atxa’s restaurant, which opened in 2005, was constructed using the guiding principles of sustainability. It is not only made from environmentally-friendly materials but makes use of renewable energy, recycles its own waste, harvests rainfall, and heats and cools itself using geothermal energy. The 36-year-old Basque chef is a champion of local suppliers and producers and his team co-operate with a Spanish research centre involved in recovering historical varieties of local vegetables. So far the project has managed to preserve 36 varieties that were set to become extinct. 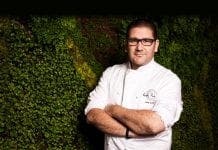 DESCRIBED by judges as part chef, part architect and part magician, Jordi Roc is the youngest of three brothers that run seminal Catalan restaurant El Celler de Can Roca. Jordi attended culinary school in Girona but was unsure of where he could fit into the established family set-up until he worked in the kitchen’s desserts section under Welsh pastry chef Damian Allsop. Jordi’s creations continue to be cutting edge and innovative and now in his mid-30s, Jordi has experimented extensively with perfumes – recreating famous fragrances in edible form. He is also the driving force behind Rocambolesc, an alternative but accessibly priced ice cream and sweet shop that opened in the centre of Girona in 2012.